About a two weeks ago, I reviewed another of Ignite's new sixth scale action figures - Napolean's Imperial Guard. 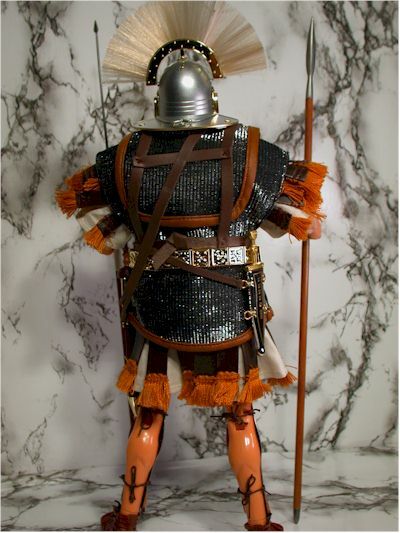 This week it's the second in their line up, the Roman Gladiator (or Centurian). Ignite went nuts with the die cast metal again, giving us some of the coolest weapons and accessories I've seen. 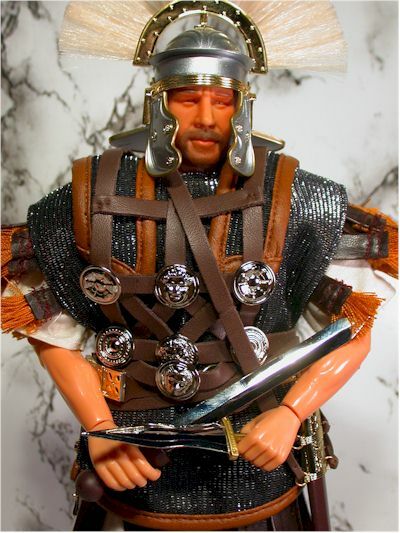 This is going to be a company to watch this year, and I'm hoping we see more of these unique and unusual figures from some of the less common historical periods. Oh, and if they wanted to do a few western figures, I certainly wouldn't complain! And for those of you that have been hoping for someone to actually do something with the Gladiator movie license, this may be your closest bet for the time being. Beautiful work once again by Ignite. 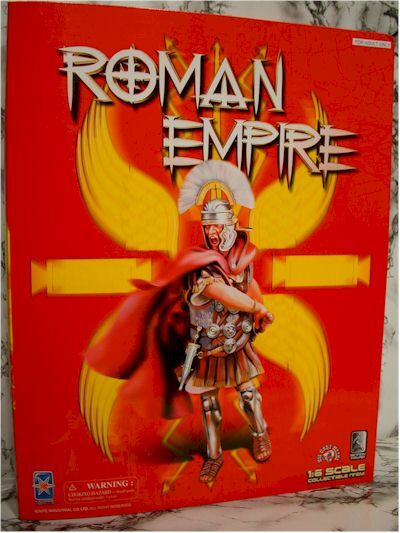 The box is very colorful, with good descriptive text and excellent graphics. Unfortunately, the same text is repeated on the back and on the inside fifth panel, and the box stock seems thinner than the competition, but other than that it's absolutely perfect. Completely collector friendly too! The head sculpt is fairly straight forward, but nicely done. 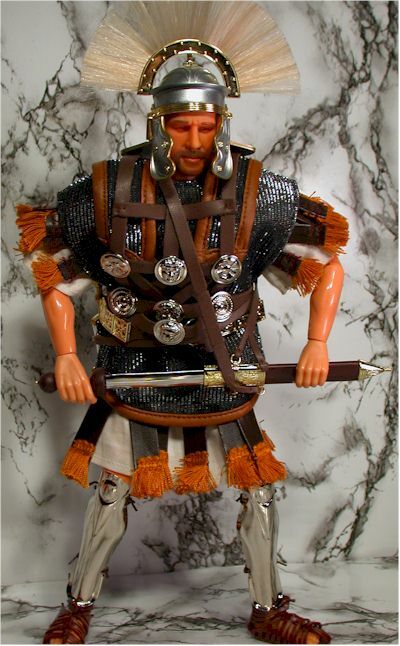 Nothing outstanding here, since the figure isn't *supposed* to look like a particular person, but just an average Roman soldier. That's not quite true however - if you look at the pictures, I think you'll agree that he looks an AWFUL lot like Russell Crowe. Hmmmm. Maybe most Roman's just happened to look a lot like him. 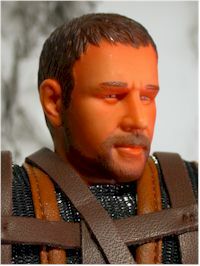 If you're looking for a Crowe likeness, this one is pretty darn good. It's a little soft, but overall passes muster. The paint ops on the head, face and eyes is excellent, with reasonable detail and little slop. The skin tone is the molded plastic, rather than paint, and I'm not as fond of that as actual painted skin, but it works alright here. There's also some paint ops on the various weapons, but the real standout is the shield. Great work, with excellent consistency and color. This is the same body as the Napolean's Imperial Guard, and has some of the same basic issues. The softer rubber hands bug me, both in terms of articulation and sculpt, but there was an even greater flaw with this figure. 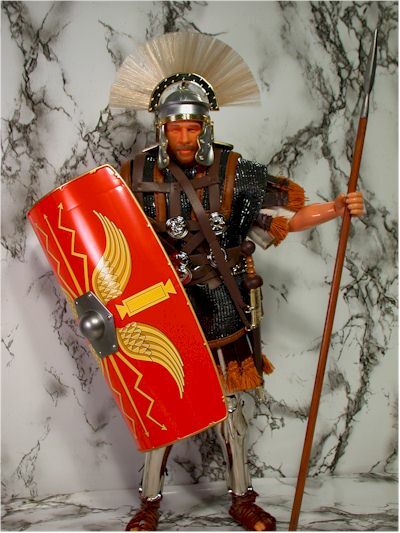 While I had no trouble posing the Imperial Guard in all kinds of ways, the Roman is very top heavy, which causes the legs to spread or buckle more easily. I don't think the joints are necessarily looser on this figure than the other, but that the extra weight above the waist is pushing him down. Still, with some adjustment and patience I was able to overcome the tendency the figure has to do the splits. Wow. Again, Ignite will just blow you away, maybe even more this time than last. I've mentioned the shield, but I'll mention it again. It looks fantastic, and although its entirely plastic, works great. It fits in his hand reasonably well, and is light enough not to drag him down or topple him over. He has four weapons - two types of pike, a short sword, and a dagger. The tips on both pikes, and the blades on both the sword and large knife are all die cast metal. 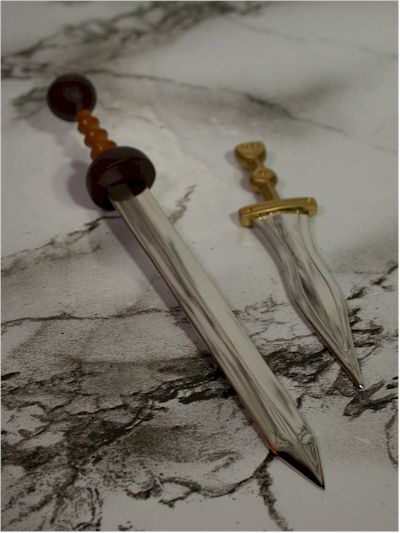 The sword and dagger are shiny as well, and all are extremely well made. The sword is easily one of the nicest sixth scale versions I've ever seen. The sword and dagger each have scabbards, which attach around his body easily and tightly with the supplied belts. If you like the weapons, you'll love the outfit. Great quality materials and stitching all around, and it's tailored to fit beautifully although there are multiple layers. Things start off with the excellent helmet. From the fan top to the die cast metal jaw/face guards, this is one of the coolest helmets I've ever seen produced in this scale. The body has an inner tunic, with an outer heavy cloth tunic. Every edge is hemmed, and there is even an excellent lining on the outer tunic. Even the quality of the little fringe is perfect - I love this outfit. 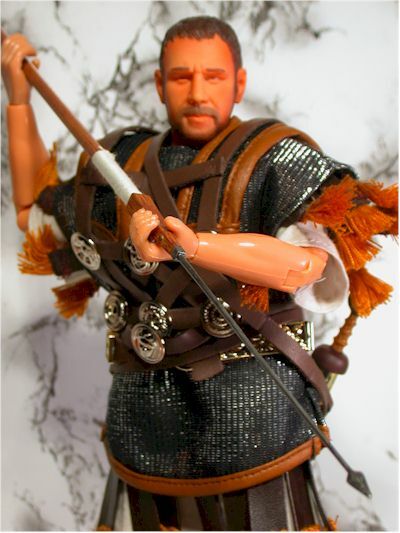 There is also a pleather strap arrangement with large die cast metal 'buttons' over his upper body. It fits the style of the belts for both weapons well, and everything looks seamless together. On both legs are die cast metal guards, again with a shiny plating like the weapons. This attach around the back of the legs with ties, and I had no trouble keeping them on and in place. They are extremely heavy, but work well and look great. If there's one problem with the outfit, it's the sandals. Now I'm sure I'll hear from people far more astute than I on this period of clothing about the various inaccuracies - please do let me know, as I'm always interested to see how well they did - but the sandals just bug me. With all the rest of this gear, you'd think they'd come up with something a little more protective for the feet. Ignoring that, the sandals are made from a soft rubber, and it doesn't approximate leather very well. They don't look as good as the rest of the outfit, but they do fit well and function fine. They don't cause any issues for him in terms of standing or balance. This guy retails for around $60, which ain't cheap by anyone's standards. Still, he's of extremely high quality, and the die cast parts and great uniform have to be driving the cost up. I'm also unsure on the run size for these figures, but it can't be huge. I doubt we'll see them getting clearanced out anywhere any time soon, but if you can get them down around $50 I'd jump on it. This is a truly beautiful figure. It's similar to the Imperial Guard, but with some subtle differences. I liked the sculpt here better, but the articulation, or at least the ability to stand and pose, was better in the Imperial Officer. Both have exceptional outfits and accessories. 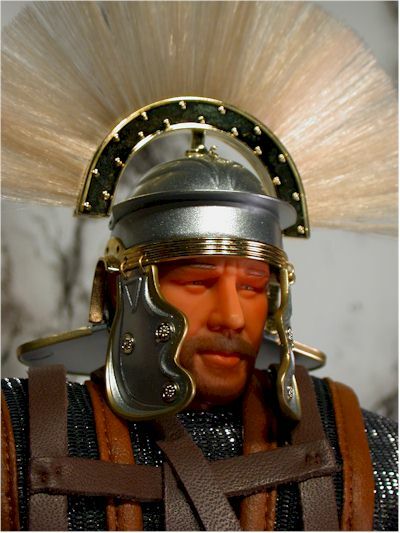 If you're looking for some variety in your sixth scale displays, or are a big fan of this historic period, do yourself a favor and check these out. Ignite has done a marvelous job, and I'm looking forward to seeing their Civil War figures along with anything else they might be releaseing. Keep scrolling down for more pictures!